This guide shows you what you can do if an employee forgets to bump their shift. Sometimes things happen and an employee may forget shift clocking on and off in the kiosk. This guide will show you what you can do in the event that this happens. Navigate to Timesheets => Approve Timesheets. Select the time period of timesheets that you would like to view. Note: Employees with unapproved time sheets will be highlighted in yellow. In the left pane, select an employee with 'Unsubmitted' time sheets. 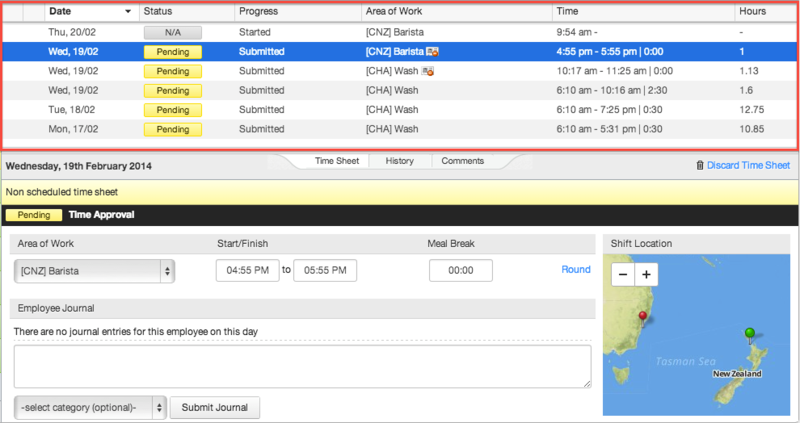 All their time sheets will be displayed in the right pane. Note: Time sheets with the 'Progress' state of 'Unsubmitted' are the result of an employee forgetting to 'start or end their shift. When resolving this issue you have four options based on employees shift details. Select the time sheet you wish to resolve. The 'Area Worked', 'Start/Finish' times and 'Meal Break' will be pulled from the roster. You can then approve the timesheet as usual. Fill in the 'Area Worked', 'Start/Finish' times and 'Meal Break' fields with the area and times that the employee worked. Approve the time sheet as normal. The time sheet 'Status' will now show discarded. Select the timesheet you wish to resolve. Click the 'Import Rostered Details' button. Click the down arrow in area worked and assign the leave type.